The piano works of Claude Debussy are among the most beautifully lyrical music ever written. The same might be said of his contemporary Maurice Ravel. They gave modernism a long look at the increased possibilities of tonality in an era when the cutting edge of the music was about to turn elsewhere for a time. And because they and Satie created a new music that was not fully followed up upon, we see them today as not only a lovely conclusion of an epoch but harbingers of the new radical tonality of the present. 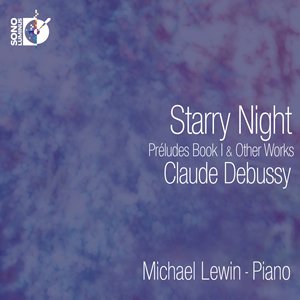 Pianist Michael Lewin gives us on Starry Night: Preludes Book I & Other Works (Sono Luminus 92190) an especially brilliant reading of some of Debussy's most lyrical works. A special treat is "Nuit d'etoiles (Starry Night)," Debussy's first published work, completed in 1880 when Claude was only 18. It was originally written as a song for soprano and piano. This is the first recording of Koji Attwood's version for solo piano alone. It is in good company with Debussy's "Estampes," the "Preludes, Book I," and a few additional shorter works. Michael Lewin is not out to impress you with technique. These works are not so much about that, though they do make technical demands at times. Foremost they call for a beautiful touch and a sure sense of phrasing which Lewin provides consistently and poetically. He is in no hurry to get through these works, but rather often lingers over them with a kind of artistic relish, a clear love of the sensuous properties of the tone combinations and a mastery of the rubato potentialities of phrasing. It is music that can be extraordinarily pellucid. Lewin makes of those possibilities something quite moving and transformative for the listener. These are some of the most moving performances of these works I have heard. The sonics are wonderful--as is mostly the case with Sono Luminus releases the album comes with a regular two-channel CD version and a Blu-ray disk with a 5:1 mix. I was unable to audition the latter version, but no doubt it sounds fantastic since the CD already does. If you are familiar with the standard Debussy readings, you will no doubt find the superior sonics and poetics of the Lewin versions here much to your liking. Don't know Debussy's piano works much? Start with this one, by all means. Wonderful! This is a disc I have been very much looking forward to. I am glad Catherine! You must have the earlier volume then? It is every bit worth the wait! Thanks for commenting.